In 2014, the Paratransit shuttle for seniors (the big lumbering bus carrying usually one or two seniors, but capable of carrying 12) made 64,000 trips in western Nevada County for about 2,000 seniors to go to the doctor, to the pharmacy, to the store, or to visit a friend. Some people say that 30 trips per year per senior just to get them out of the house is far too few—others say far too many. Needless to say, there were zero pick-ups needed for the 20 seniors living in our cohousing community. Neighbors swing by to offer assistance if needed—“I’ll just pick up your medicine when I’m there”—and their best friend lives next door. Last year Americans drove over 7 billion miles to serve seniors at home, mostly Meals-on-Wheels and Nurses on the Go. (National Association for Home Care and Hospice(link is external)) At Nevada City Cohousing, that didn’t happen at all. Community is what made my grandmother’s final years worth living. She lived in a small town of 325 people and was mostly bedridden in her waning 10 years. Fifteen locals looked after her; she didn’t spend a day in a nursing home. But she had that kind of small town caché. Cohousing is just that kind of reconceiving; the kind of reconceiving of community that we have been waiting for. It’s time to stop boxing ourselves into narrow parameters and face our realities. Many of us don’t have extended families nearby, we don’t have stay-at-home daughters to take care of us anymore, and we have few high-functioning small towns. According to Harper’s Magazine, 6,000 small towns have evaporated in Kansas since 1970, bought out by agribusiness. (Harper’s Magazine(link is external)) But if we look up, we do have cohousing, and cohousing-inspired communities, within our reach. At the other end of the spectrum (from community to disconnection), I find it disturbing when I read that the suicide rate of seniors is up to all-time records. According to the New York Times, suicide in citizens over 50 increased as much as 60 percent from 1999 to 2010. (New York Times(link is external)) The social restraints, excuses, and myths that we let rule our lives produce an isolation that demonstrates that all of the current social norms are unfortunate at best. Perhaps suicide has come to be the ultimate individual statement: you really are all by yourself. Which reminds me of a young local homeless woman who told me once that her grandfather committed suicide while alone in his big house. It made me ponder: who was better off? At least she had a community in her homeless camp. 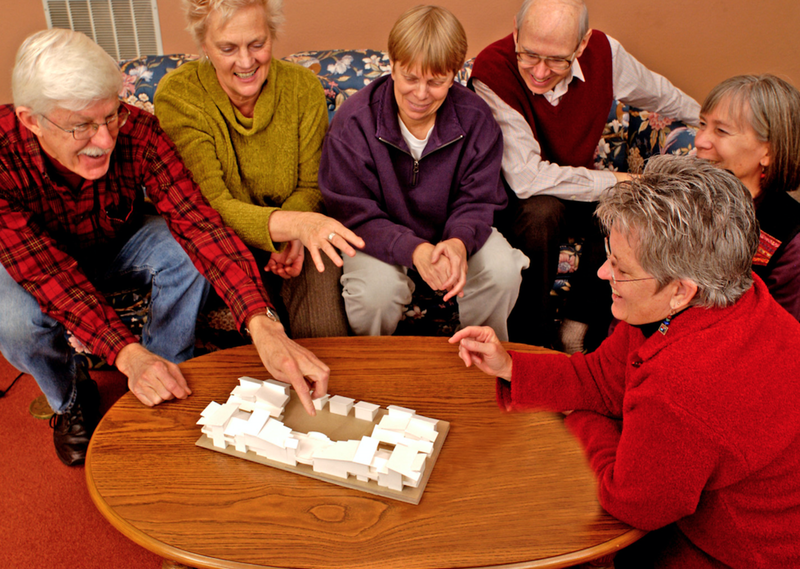 Seniors are increasingly valuing health and fun, and are choosing cohousing as a model that embraces this environment. I went to a concert in Nevada County a month ago, only to meet two cars full of senior cohousers from Wolf Creek Lodge(link is external) Senior Cohousing who had carpooled to the event. Having neighbors that you can break bread with—community—is simply essential to your wellness. Currently, the myths that we live by – self-imposed restraints and fear of change keep many from considering cohousing and cohousing-inspired communities as an alternative to traditional housing models. These models, however, become more and more restrictive and isolating over time, and pretty soon, you’re left with no alternative but to move into a senior living where you have no say, no independence. And stale, manufactured community (if you can call it community).